Having been a fan of Tolkien’s faerie tales since I was chasing squirrels in the oaks and hickories of the heartland, it’s no surprise I’m excited to see the Hobbit. My dear Alejandra even bought me a ticket to the opening show at our local theater. Of course, that requires staying awake! If you too have any intention staying up for a midnight cinematic premier, mother nature will provide a premier low tide (-3.6’ish) to fill the “I really should be going to bed now” hours with “Ooo’s” and “Ahh’s” in the beam of your light. For most of the inland Salish Sea, the tide will be in minus territory any time after 9:pm and bottoms out around around 11:pm. It’ll probably be wet and chilly, so dress well and feel free to share what cool things you see through comments or by contacting me directly. ‘Tis the season for storm surges. The week before Thanksgiving, I saw the 12’ predicted high tide lapping on the beach as I walked off a ferry to West Seattle. A stream babbled north under the dock, well above the tide and buffered by large wood and another few feet of gravel/sand beach. I traveled the same path a week later, when the predicted high tide was actually a few inches lower. However, the storm tide had swamped the beach logs and stream both, lapping in the vegetation of the recently restored shoreline. Numerous logs with cut ends had rolled and floated out into the bay – an example of the sub-par services cut logs provide when compared to their rooted and branched brethren. You may also recall the heavy rain before Thanksgiving. Along with that came the surge that I observed and that you can see in the graph below. The actual water levels (red) pushed almost 2 feet higher than the predicted level (blue). The green shows the difference between the two. When predictions hold, the green line stays on zero. Tides are predicted based primarily on the locations of the Earth, Moon and Sun. Those astronomical or predicted tides are the numbers we see in our tide tables, apps or calendars. We have a great deal of certainty as to where the heavenly bodies will be at any given time in the future, but back on our corner of the blue planet, long-range weather details are largely unknown. 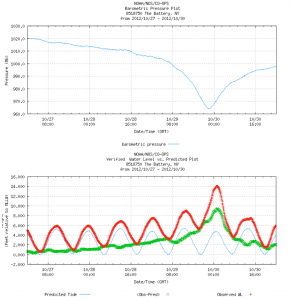 Consequently, we have no long-range ability to factor storm surges into our tidal predictions. Storms, caused by the collision of colder northern air and warmer southern air, set our Pacific waters in motion. The warm air rises, lowering the pressure the atmosphere applies to the ocean and allowing the ocean to swell. That pressure-driven surge is accompanied by some level of wind-driven surge, as the rising warm air also fosters stronger winds that pile the water up on the coastline. Since our region is spared tropical cyclones (we seem satisfied with earthquakes and volcanoes), our storm surges are mild compared to what everyone watched the East Coast suffer during Hurricane Sandy (right). Still, it’s not unusual for our waters to surge 1 or 2 feet higher than expected during stormy seas. If you enjoy exploring graphs and numbers, you can have some fun through NOAA’s Tides & Currents portal. You can even check out sea level changes over time and historical extremes. 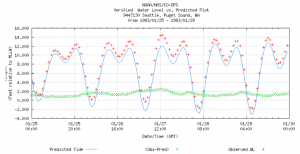 The “Seattle, Puget Sound” station’s highest recorded water level was in January 1983 at +14.48 (right). Not too bad considering our recent big surges were about +14. 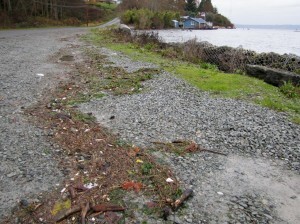 Certainly nothing compared to the extra 10 feet piled onto the east coast shorelines. 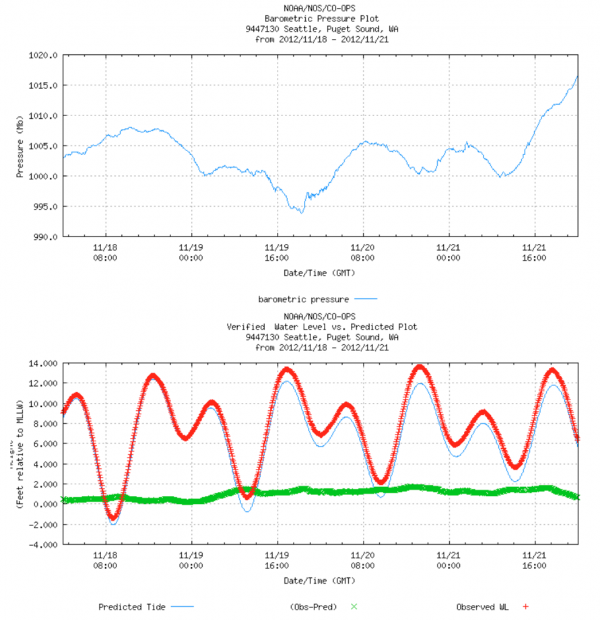 When you’re playing with the numbers and graphs, remember the -8hr conversion from GMT and a -7.94 feet conversion from the extremes section to make them comparable to what we’re used to seeing (based on mean lower low water [MLLW] as 0.0, instead of the station standard that’s 7.94 feet below MLLW). Have fun exploring NOAA’s online tidal treasures and our last lowest tide of the year! And if you fall asleep at work or school tomorrow… you didn’t read this.